Robert Rotberg is the founding director of the Harvard Kennedy School’s Program on Intrastate Conflict, a former senior fellow at CIGI and president emeritus of the World Peace Foundation. Patients await treatment at a makeshirt cholera clinic in Harare, Zimbabwe, Sept. 11, 2018. Dictators kill, and do so mercilessly. 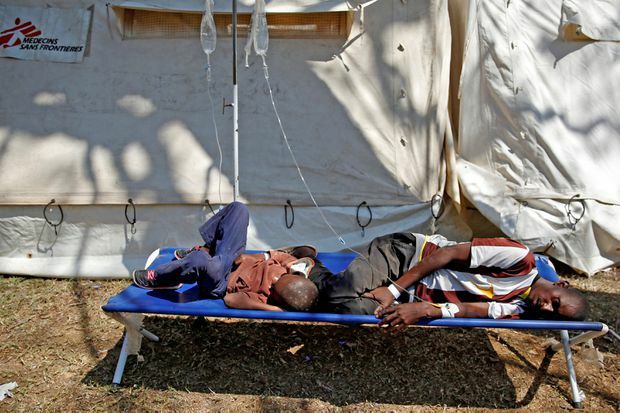 The hundreds of Zimbabweans dying this month from easily preventable bouts of cholera can blame the past 20 years of ex-president Robert Mugabe’s reign for their fatal misfortune. By the middle of September, more than 5,000 people had been infected and 30 killed in the outbreak. Typhoid, another disease stemming from bad water, is also raging in Harare. Ten years ago, another cholera calamity killed 3,000 and infected at least 100,000 citizens in Zimbabwe. Recently elected President Emmerson Mnangagwa declared a state of emergency and cancelled all public events in the capital, but the disease nevertheless has spread to five of the country’s 10 provinces, and to many towns. “It is alarming and quite unusual for such a medieval and preventable disease to continue to claim such valuable lives in this day and age,” a coalition of concerned local non-governmental organizations declared. Cholera outbreaks are one telling sign of state failure – of the breakdown of the governance institutions that in more modern and robust nation states provide essential services such as protection, roads, schools, health clinics and adequate supplies of drinking water to residents. They also signify the neglect that Mr. Mugabe and his ruling Zimbabwe African National Union – Patriotic Front (ZANU-PF) party visited upon Harare and other cities. ZANU-PF disdained them because urban dwellers generally favoured the opposition Movement for Democratic Change. In northeastern Nigeria, on the other side of Africa, the government’s inability to quell the Boko Haram insurgency has also led to 24,000 cases of cholera and at least 600 deaths in the Borno and Yobe states and around the edges of Lake Chad. Stagnant pools of water from heavy rains and flooding, and inadequate sanitation, are responsible. During the increasingly desperate later years of Mr. Mugabe’s harsh incumbency, Zimbabwe’s epidemic of widespread corruption stole operating funds from all kinds of municipal services, especially those as basic as chlorine for city water systems and the replacement of worn-out cast-iron pipes carrying supposedly potable water. Then, too, the capital city Harare’s sewage-treatment plants were maintained so carelessly that they could no longer function well enough to treat inflows of waste. The result, especially when sewage pipes overflow and mix with already deficient flows of drinking water, is foreseeable tragedy. Thirty per cent of the households in sub-Saharan Africa lack reliable access to clean water. The Zimbabwean figure is even lower, and possibly one of the least attractive on the continent. The long-suffering inhabitants of Harare have indeed lacked abundant supplies of drinking water at least since 1998, when Mr. Mugabe’s increasingly harsh and discriminatory associates first began to appropriate the riches of the country for themselves and consequently slimmed state contributions to places such as Harare, where opposition elements ruled. When this conscious decision to starve municipalities of funds coincided with currency manipulations, an invasion of the Democratic Republic of the Congo to sustain the Kabila dynasty and to raid copper and cobalt mines, an agreement to pay over-the-top pensions to so-called war veterans – who, in many cases, were too young to have battled for independence – and the chasing of white farmers off productive farmlands, an era of hyper-inflation ensued. Mr. Mugabe and his cohort became rich; protecting water became an afterthought. For at least a decade, more and more Zimbabweans, usually wealthy homeowners, have been forced to drill artesian wells to obtain reliably fresh water. Today, the city’s water system serves only 50 per cent or fewer of its residents, and does so erratically and dangerously. Cholera epidemics come from dirty water. Those who contract the deadly disease die rapidly if victims remain untreated; if bodies are not removed promptly; if household sanitation is impaired by broken pipes, deficient garbage collection and woeful management of an infrastructure that was last refurbished in colonial times, before 1980. Obadiah Moyo, Zimbabwe’s brand-new Minister of Health, said that he would remove garbage dumps from high-risk sectors of Harare and repair sewer pipes. But it will take years to replace the hundreds of miles of piping. Given continuing high inflation in Zimbabwe, given Mr. Mnangagwa’s inability so far to provide an improved rule of law (after a questioned election result in late July), given large-scale continuing corruption and given the President’s appointment of a disappointing set of cabinet ministers, it is no wonder foreign investment still shies away from his country, and why – after a long dictatorship of which Mr. Mnangagwa was a part – domestic engines of growth remain sluggish. Cholera and typhoid are symptoms of pretend democracies that ignore the public interest.